Reminder: We live in an area where we encounter the thaw/freeze effect of melting snow and flooding during heavy rains and spring run-off along the trails. Always use caution as you travel the trails and be aware of possible icy conditions (especially in shady areas and/or in the early mornings or evening hours) and flooding (especially in low areas and underpasses). Warnings are posted in areas of concerns as soon as possible, but individuals need to be aware and prepared and ALWAYS obey any barricades and/or detours as they are in place for your safety. View more information and sign up for email notification on Trail Status or visit NoCo Trail Report for a map of trail closures. 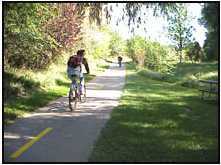 Fort Collins has several trails for walking, jogging, in-line skating, biking, or a leisurely stroll. The trails are maintained year round and snow is removed from the trails during the winter months. Trails serve as commuter routes for many students and residents as well. The beautiful scenery that can be enjoyed along the system often makes one forget that they are in urban Fort Collins. Poudre Trail and Spring Creek Trail have quater mile markers, which have been calibrated through GPS for accuracy. The recreational trails are open the same hours as our parks, 5:00am until 11:00pm. There is to be NO marking on the trail system or sidewalks; this includes chalk, paint, tape, etc. A courtesy speed limit of 15 mph max for cyclists using the trail is strongly advised to keep ALL users safe. Permits are required for walks/runs taking place on the trails; only 4 competitive races are allowed per year. Cones or flags can be placed along the side of trail to show participants the route; and these must be collected at the conclusion of the event. Bike events are not allowed on the trails. The trail/sidewalk is not closed to other users during a non-competitive run/walk. Since the trail/sidewalk will remain open for other users, staggered start times, no crowding on the trail/sidewalk, and being respectful of other users is expected. This allows all citizens to enjoy their outing on the trail. Travel with a companion. There is more risk after dark. Rain, snow, ice, leaves and sand may make the trail slick and dangerous; if barracades are in place, please obey the detours. Keep your pets on a leash at all times. Please pick up after your pets. Minimize horse travel on hard surface trail sections. Please pick up after horses on both hard and soft trails. Use an audible signal "On Your Left" when passing another trail user. Stay to the right of the center stripe and always yield the right-of-way. Cyclists should travel in single file and at a controlled speed. Please be cautious of oncoming pedestrians especially at underpasses, bridges, and sharp/blind corners. Use a light that is visible from the front when traveling at night. Always be aware of the possibility of high water along the river and use caution when traveling through the underpasses. The Poudre Trail meanders along the Poudre River for 10.10 miles. It currently runs between the Overland Trail at Lyons Park and the Environmental Learning Center on East Drake. Expansion of this trail east toward I-25 is expected over the next several years. 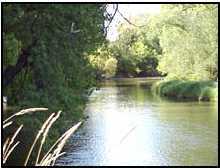 The Spring Creek Trail follows Spring Creek through several parks in mid Fort Collins for 6.93 miles. It currently extends from West Drake Road to the confluence of Spring Creek and the Poudre River where it joins the Poudre Trail. The Spring Creek Trail extends through a new underpass of Taft Hill Road. This highly popular trail continues to Spring Canyon Community Park and the Pineridge Natural Area Funding is from Conservation Trust(Lottery) revenue. The Mason Trail serves as a convenient route in the central core of Fort Collins and is maintained by the Streets Department. Stretching from Prospect Road to south of Harmony Road adjacent to the Burlington Northern Santa Fe (BNSF) railroad corridor, the trail offers a solution to improve safety and mobility for cyclists and pedestrians traveling north and south in the city and is 3.5 miles. This trail will also connect to the other trails located within the city, such as the Spring Creek Trail and the Fossil Creek Trail. The Foothills Trail is a 6.8 mile earthen trail that travels along the foothills parallel to Horsetooth Reservoir from Dixon Reservoir at Pineridge Natural Area to Reservoir Ridge Natural Area and Michand Lane. This trail is on rugged terrain. The Fossil Creek Trail currently runs through the Cathy Fromme Prairie Natural Area along Fossil Creek. It extends west and north to meet the Spring Creek Trail at Spring Canyon Park. In the future it will also extend from Shields Street to meet up with the section of Fossil Creek Trail at College Avenue. New segments will open as right-of-ways are established and construction finishes. The Fossil Creek Trail is 5.17 paved miles. Fossil Creek Trail at College underpass light information: With user safety and energy savings in mind this light system was designed to take into account the adjustment of a person's eyes going from dark into the tunnel and back out or bright daytime into the tunnel and back out. Certain lights work at certain times to reduce night blindness. The system also takes into consideration the time of day, sunrise/ sunset times and light levels at dawn and dusk. The Power Trail follows the west side of the Union Pacific Railroad south from Edora Park to north of Harmony Road via Golden Meadows Park then south on McMurry Avenue and Keeland Drive to the west side of the railroad to Triby Road. Future phases will extend the 10-foot concrete trail and 5-foot gravel path south beyond Harmony Road eventually to Loveland’s trail system. Funding is from Conservation Trust (Lottery) revenue. The Power Trail is 3.89 paved miles. The ELS uses a series of metal signs posted every quarter mile. The signs on the Poudre & Spring Creek Trails represent the distance you are from College Avenue, either East or West. The signs are similar on the Power Trail and represent the distance you are from Drake Road, either North or South. If an incident occurs, find the nearest ELS sign and report that information to the proper authorities. City Trail Distances - This is a list of trails and distances. The Adopt-A-Trail program utilizes the resources of citizens to assist the City in maintenance of the trail system. Short sections of trail are adopted by individuals, companies, clubs and other entities to patrol their section for trash, debris and litter. A small sign is placed on the trail identifying you as the adoptor of that particular section. There may be a wait, as this popular program is taken advantage of by many groups. Other trails that are planned include spur trails from the three major trails and cooperative trails along the Poudre River to Greeley and segments south to Loveland. You can enjoy the trails year round. So start today and relax on one of Fort Collins great multi-recreational wonders.